So what's so special about the Mall Road in Darjeeling? One who has taken a stroll along this mystic tree shaded meandering road and enjoyed the views of the mountain ranges and the lovely Rhododendrons, knows all about it. While no two places are the same, if you have walked along the Camel's Back Road in Mussoorie, or along the pedestrian pathway in Dalhousie that connects Gandhi Chowk with Subhash Chowk, you will get a hunch of what I am talking about. 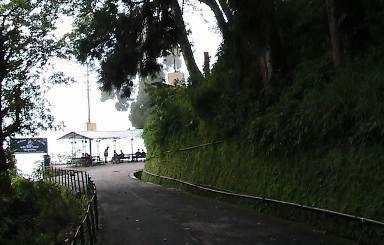 Mall Road is a mountain walkway the British families once used for leisure strolls to enjoy the sheer serenity and the best views that Darjeeling has to offer. It's no different now. If you stroll along the Mall Road early in the morning or in the evenings, you will see many locals and their families are taking a stroll, many doing their exercise, and there are joggers who run this loop of about a mile several times. Yes it's actually a loop, that starts from the Chowrasta Mall (i.e. the main square), goes around the Observatory Hill and returns to the Mall itself. So there are two entries to this road from the Mall. The Mall road is also known as Bhanubhakta Sarani named after the Nepali national poet whose statue is erected on the Mall where the road begins. There is a common and a wrong notion that the road that leads up to the Mall from Gandhi Road and through the busy area with shops and stalls on both sides, is the Mall Road. That's actually the Nehru Road and not the Mall Road. Let's start the walk from the left entry to the Mall road and take a full round and get back to the Mall from the right. The whole walk should take about 20 minutes plus the time you take for the views. At the entry of the Mall road you will see benches on which locals and tourists would be sitting and enjoying the ambience of the Mall from a corner. As you walk along, you will find low iron fence on the left, and on the right is the Observatory Hill rising steeply. The stony wall of the hill is perennially covered with green moss and shrubs, and if you look up, you will see lots of rhododendrons. On the left, you will see many lovely private cottages that are homes to the locals. In this area, only the wealthy people can afford to stay these days. There are shaded seating available on the way to relax and enjoy the greenery. Almost the entire Mall Road is shaded with trees as you can see in the picture. 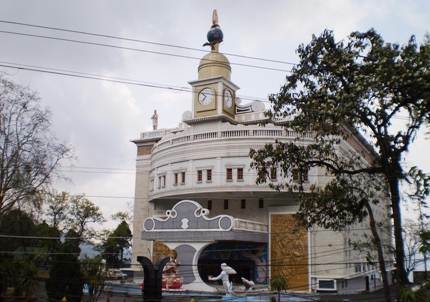 Further down and on the left you will find the Bhanu Bhawan (also known as Gorkha Ranga Manch Bhawan) a huge white building with a golden dome on the front top. If you look at the top of the dome, you will see a statue of a man with a Khukri in his hand. Khukri is a traditional Nepali curved knife that was earlier used as a weapon. Ranga Manch is an auditorium and is used for public functions. If you go during the festival times, you will also see country fairs being held here at the outside premises with many stalls selling various household goods, garments, food and lot more items. It's a great place to meet the locals and experience the vibe of Darjeeling. Opposite to Bhanu Bhawan, a narrow road goes up towards the St. Andrew's Church which you can see from the Mall Road itself. 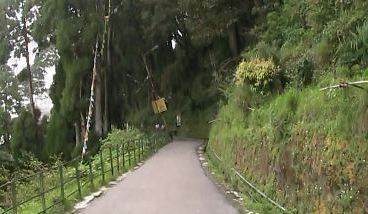 The uphill narrow road passes by the Darjeeling Gymkhana Club and ends at the Darjeeling Tourist Lodge further up. As you walk further down the Mall Road, it takes a full gradual turn back towards the Chowrasta Mall and encircling the Observatory Hill which continues to remain on right. At the turning of the road, you can see the huge gate of Raj Bhavan, which is the summer residence of the Governor of West Bengal. Due to security reasons, entry inside is no longer permitted. From here-on the road is known as Mall Road (East) and is famous for Kanchenjunga views. Keep walking along, and you will soon see a white building on the left which once used to be the Mall Guest House opening out to the great mountain vistas. This is where I used to relax and take a cup of coffee in the earlier days. It has been now taken over by the Dolphin Group and converted into Dolphin Hotel. You can easily imagine that some of the view rooms in this hotel would be really precious. But you don't need to stay in that hotel to get such great views. Just next to the hotel there is a public viewing area with seats. 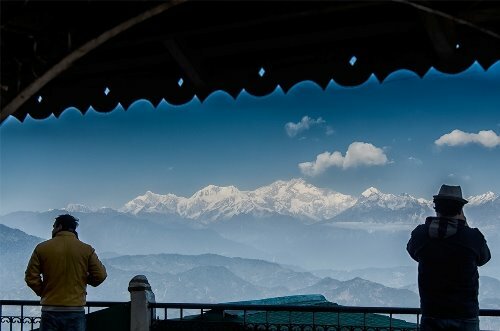 This is one place from where you can not only see the valley below, but on a clear day you won't be able to take your eyes off the Majestic Kunchenjunga and the other snow clad peaks of the eastern Himalayan range. Further down about five minutes from here, there is another such great viewing area with even larger seating provisions with shades. There are in fact three viewing areas on this section of the Mall road. However, this second view point is the best for watching the peaks of Kanchenjunga in blazing colors as the sun rises. If you can't make it for the Tiger Hill Sunrise, then the next best option is to come here early in the morning and watch the sunrise. The view is awesome. In the evenings, you will find a local lady selling steaming hot tea here. She seems to have made one of the benches as her own tea stand. She also offers snacks like alu bhurji (Nepali), biscuits etc. As you walk, the lovely view on the left continues and you reach the last view point as you can see in the above picture, ahead on the road. But before that, you will see a ramp and flights of stairs on your right that leads to the Observatory Hill and the Mahakal Temple. Soon you are back to the Chowrasta Mall having walked for about a mile. You are back again in the activities, with people sitting all around the mall in the benches, chatting and indulging in street snacks sold by the many vendors. 1) Check out Darjeeling Map to see the location of the place. 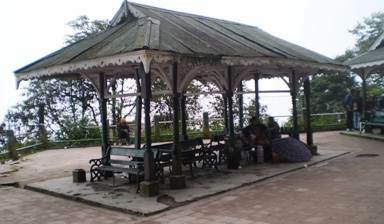 2) Check out Darjeeling Tourist Places to know about many other great sightseeing places. Share your experience or stories.